The brilliant white blooms of the gardenia are only their second best feature – that heavenly smell they produce fills the air with a scent like no other. It’s no wonder that gardeners are extremely protective of their gardenias! Unfortunately, even the most pampered plant may develop one of the common gardenia diseases. This handy guide will arm you with the knowledge to properly care for your favorite plant. Most common diseases in gardenia plants are caused by fungus and easily prevented by creating a well-draining environment with good air circulation. Proper watering and pruning further helps to keep gardenia plant diseases in check. Among the most common diseases of gardenia are root rot, powdery mildew, stem canker and bud drop. Treating gardenia problems like these is a task most gardeners can handle. Root rot is common in plants that are chronically over-watered or are growing in poorly draining soil. A variety of fungal pathogens take advantage of the stressed plant and destroy root tissues, causing them to turn brown, black or mushy. You may notice that your plant is yellowing, with the oldest leaves affected first – it can come on gradually or cause a sudden widespread wilt in your gardenia. You can often save plants with root rot by digging them, pruning away damaged roots and replanting them in a spot with better drainage. Be careful to only water when the top two inches of soil feel dry to the touch to prevent future problems. Powdery mildew results when air circulation is poor, allowing humidity to build around dense bushes or tree canopies. Unlike other fungal diseases, standing water isn’t necessary for powdery mildew spores to germinate, but they can’t survive without constantly humid conditions. Powdery mildew causes a distinct white, fuzzy or powdery coating on leaves and deformation of new growth. Neem oil is very effective control, but you should also consider thinning the inside of your gardenia to allow for better air circulation. If your gardenia is potted or indoors, move it away from structures and other plants. Powdery mildew isn’t serious, but a chronic case can drain a plant, allowing other pathogens to invade. 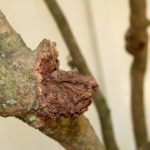 Stem canker only affects a small percentage of gardenias yearly, but it’s a serious disease that every grower should be aware of. These dark, oval lesions are caused by the fungus Phomopsis gardeniae when it manages to gain access through wounds. Galls may form on affected branches, but more often, widespread wilt is seen. 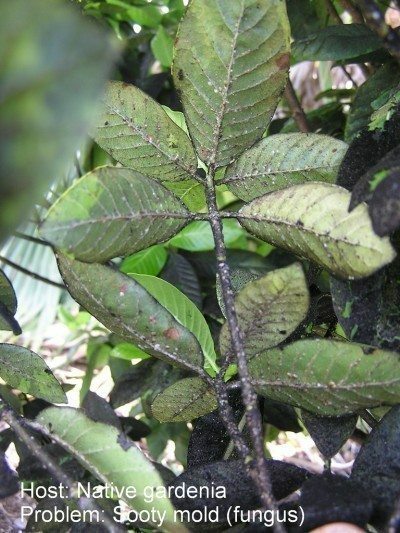 The plant may stunt or drop leaves and buds, depending on the seriousness of the infection. The only control is to remove the affected stems, cutting back well into healthy tissues. Disinfect your pruners between cuts to prevent spreading the disease further. As with other fungal diseases, increasing drainage, taking more care in watering and increasing air circulation can help prevent recurrence. 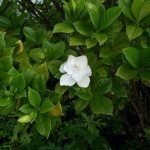 Bud drop appears in stressed gardenias, but can be baffling to gardeners who have never seen it before. As the name implies, the primary symptom is bud and flower failure – they simply drop or dry up with few other clues. Pests and environmental problems are to blame for this common problem – check your plant carefully for tiny bugs and treat accordingly. Additionally, sooty mold can be seen on plants affected by insect pests, like aphids. Treating the pests will normally take care of the fungus. Neem oil works well for both. If no insects are present, you may need to adjust your watering habits, fertilize more carefully or provide better protection from sudden cold spells. Read more articles about Gardenia.